The last full scrape of the Freecode RDF files took place in March. The data for the March 2014 Freecode collection is available for download from the FLOSSmole FC data site (or in the MySQL database). 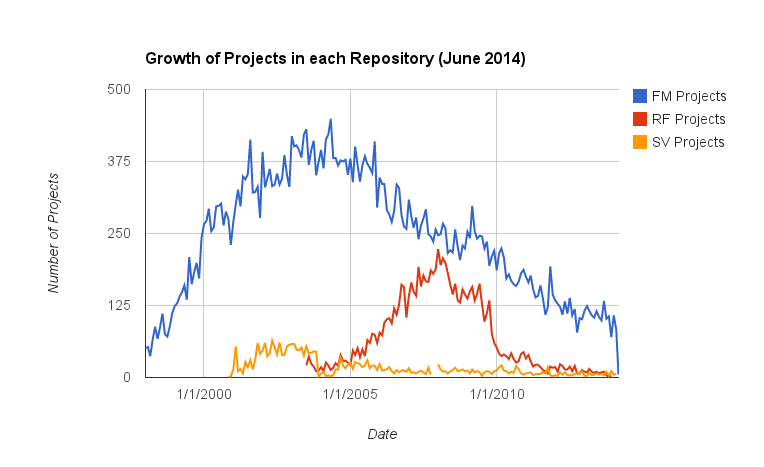 This chart shows the number of NEW projects added to each repository by month/year. Notes: RF had ~750 projects without a project start date. This chart shows the number of new projects in each repository that use the words "Free" and "Open" in project names through 2014. Freecode (formerly known as Freshmeat) is a directory of free and open source software. FLOSSmole has been collecting Freecode/Freshmeat data since 2004. Periodically we provide snapshots as to the growth of the various forges and directories we collect data from. Here is a chart showing the rate of new project additions to Freecode/Freshmeat from January 1998 - March 2014. This data is based on the registration date recorded for each project and collected by FLOSSmole in June 2014(datasource_id 8079). This chart shows the new project registrations for each year 1998-2014, and what programming language those projects were tagged with. 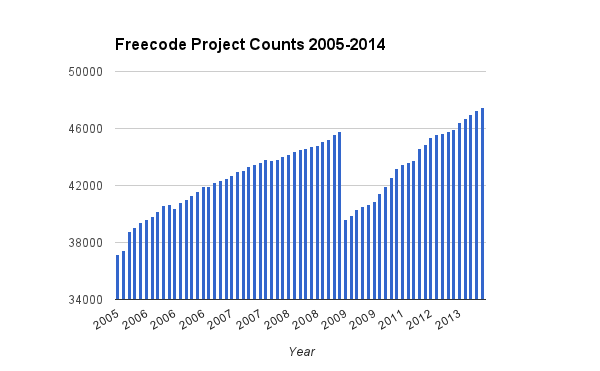 For example, 2003 was the highest year for new "C" projects to be registered with Freecode (then called Freshmeat). This chart shows the new project registrations for each year 1998-2011, and what programming language those projects were tagged with. Freecode (formerly known as Freshmeat) is a directory of free and open source software. FLOSSmole has been collecting Freecode/Freshmeat data since 2004. Periodically we provide snapshots as to the growth of the various forges and directories we collect data from. Here is a chart showing the rate of new project additions to Freecode/Freshmeat from January 1998 - June 2012. This data is based on the registration date recorded for each project and collected by FLOSSmole in mid-July 2012 (datasource_id 316). 1. Freshmeat announced a name change to Freecode. 2. We have an issue (issue #43) that talks about how the trove definitions for Freshmeat are out of date. For issue #1 - decided not to rename our abbreviation for Freshmeat. It will remain "FM".